Mythology has always been a huge part of The X-Files and it’s still very present in the latest batch of episodes that make up season 11. Released on Blu-ray and DVD today by 20th Century Fox Home Entertainment, The X-Files Season 11 features all 10 episodes from the latest season with David Duchovny and Gillian Anderson reprising their roles as Fox Mulder and Dana Scully. The home entertainment release is packed with over plenty of extras and the Blu-ray boasts over 2 hours of special features, including featurette Solve For X – Mythology Episodes. To celebrate the release of season 11, we’ve got a clip from that featurette for you to enjoy! 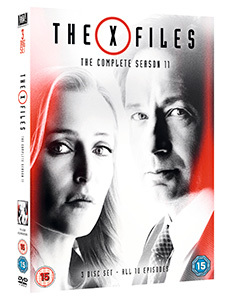 The X-Files Season 11 is available on Blu-ray and DVD now.